Roman Britain. Opening title:- “This was a land where druid priests held sway over peoples minds and prophesied that one day a woman would wear armour and wield a sword against the Romans. 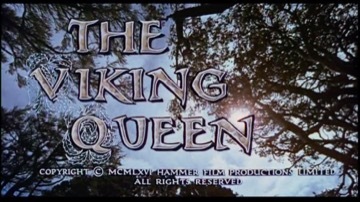 A woman who would be called – The Viking Queen”. On his deathbed, old King Priam names his daughter, Salina, as his successor. She is a peace-loving young woman who tries to keep all sides – Druids and Romans alike – happy, at the same time falling in love with the Roman commander Justinian. But, circumstances soon dictate that she must take sides against the man she loves. American star Don Murray’s credits include “Bus Stop” (1956), for which he received an Oscar nomination, Fred Zinnemann’s “A Hatfull of Rain” (1957), Bachelor Party (1957) and Otto Preminger’s “Advise and Consent” (1962). New find Carita did not enjoy the same success as Ursula Andress and Raquel Welch and appears to have vanished without trace after this film.